Chengyang is a wonderful little cluster of villages just 18 kilometres away from the city of Sanjiang. The eight villages, known separately as Ma’an, Pingzhai, Yanzhai, Chengyang-Dazhai, Pingpu, Pingtan, Jichang and Guandong, are predominantly inhabited by the Dong ethnic minority. From lofty Drum Towers to elegant Wind-Rain Bridges, their vibrant culture shines amongst Guangxi’s karst mountains. This farming community is punctuated by fields ripe with tea bushes, bubbling brooks winding past misty mountains, and wooden structures of all shapes and sizes. With eight magical places vying for your attention, you’ll be spoilt for choice! 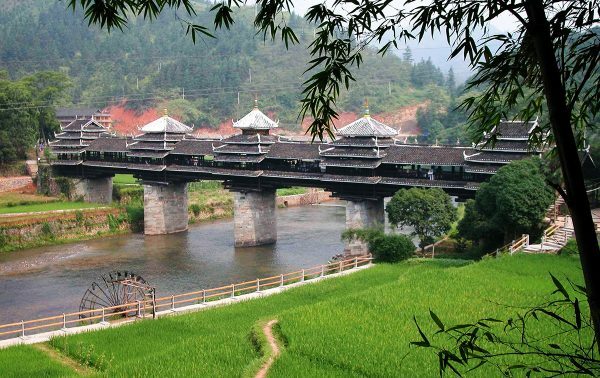 Yet the main draw to this scenic area is Chengyang Wind-Rain Bridge, which was built in 1912 and is now over 100 years old. Though there are hundreds of wind-rain bridges in the area, this one is considered the most magnificent. It is also known as Yongji or Panlong Bridge and is made up of 2 platforms, 3 piers, 5 pavilions, 19 verandas, and 3 floors, giving it the appearance more of a palace than a bridge! It spans nearly 65 metres (211 ft.) in length and was miraculously built without the use of nails or rivets. The local Dong carpenters simply used dove-tailed joints to hold this amazing structure together and managed to accomplish the whole project without the use of blueprints! In true Dong style, the villagers of Ma’an also hold performances twice every day. The Dong ethnic minority are well-known for their harmonious grand choirs and watching one of these performances represents both an audible and visual feast, from the soulful folk songs of the town elders to the dazzling festive outfits of the local girls. If you happen to be hiking through this cluster of villages, you may even come upon an impromptu performance in a local drum tower. Just be sure to give the villagers a small tip, otherwise the next song they sing might end up being “The Foreign Cheapskate”!